Five ciders from Bristols Cider House and five cheeses from Fromagerie Sophie. Let the tasting begin. 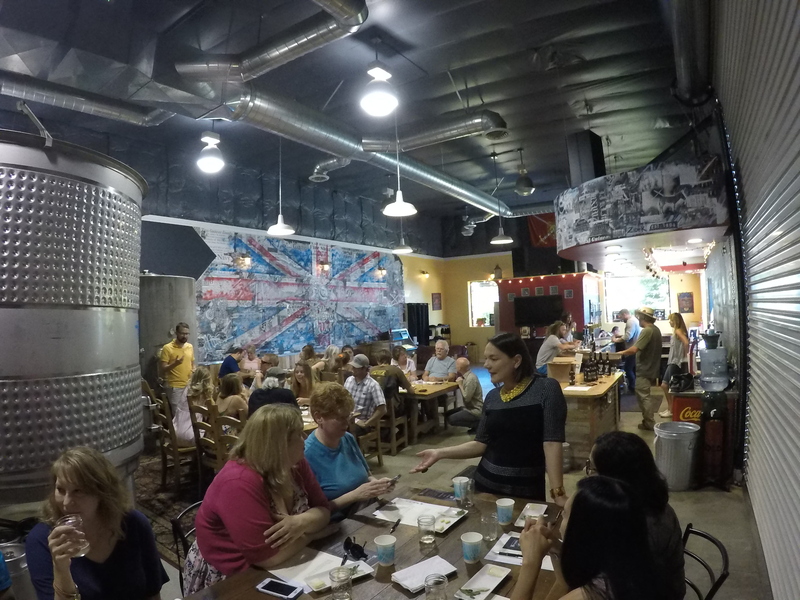 Last Saturday, June 3, Bristols Cider House in Atascadero hosted the first of what the Flavor Team hopes is many cider and cheese pairing events with Fromagerie Sophie, the delightful cheese shop in San Luis Obispo. 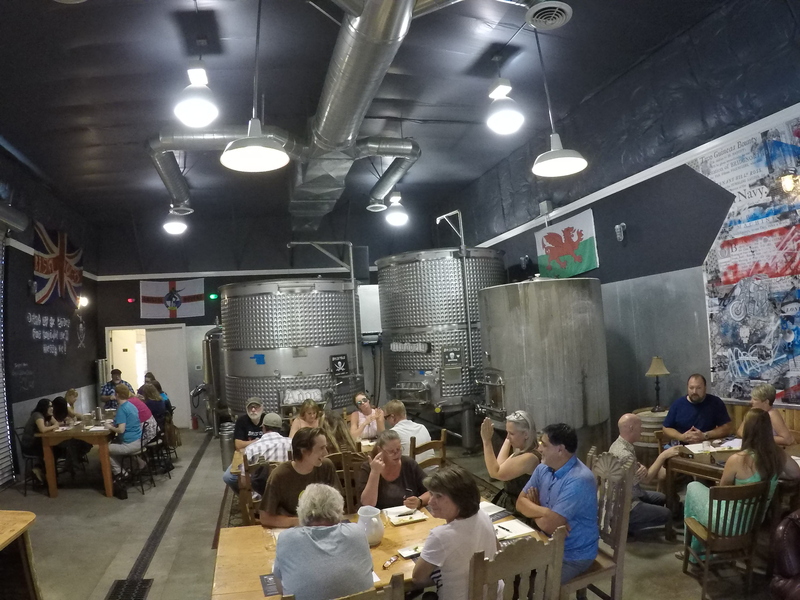 Bristols Cider House owners Neil and Marcy Collins and Jackie bring England’s best cidermaking methods to the Central Coast. Lucky for all of us. As we arranged the interview with Erich, he mentioned the cider and cheese pairing. Maybe we’d like to do the interview and then stay for the pairing? When we heard about this match up – thinking of that simple yet sublime pairing of crisp apple slices circling the plate with wedges of cheese – we signed up right away. Good thing, too, because the 20 seats available for this inaugural event sold out quickly. The Flavor Team has enjoyed hard cider for a long time, appreciating how a quality cider reflects the talents of the cider maker as it’s crafted to match the creator’s vision. While we know a little bit about cider making, we know close to nothing about cheese making (we do know that cows are often involved), so we were excited for the opportunity to experience and learn more about both. The sellout crowd of 20 happy pairing participants mingles before the tasting begins. We took our seats around one of three wooden farm tables. Our fellow cider and cheese explorers were equally excited to see what the afternoon would bring. 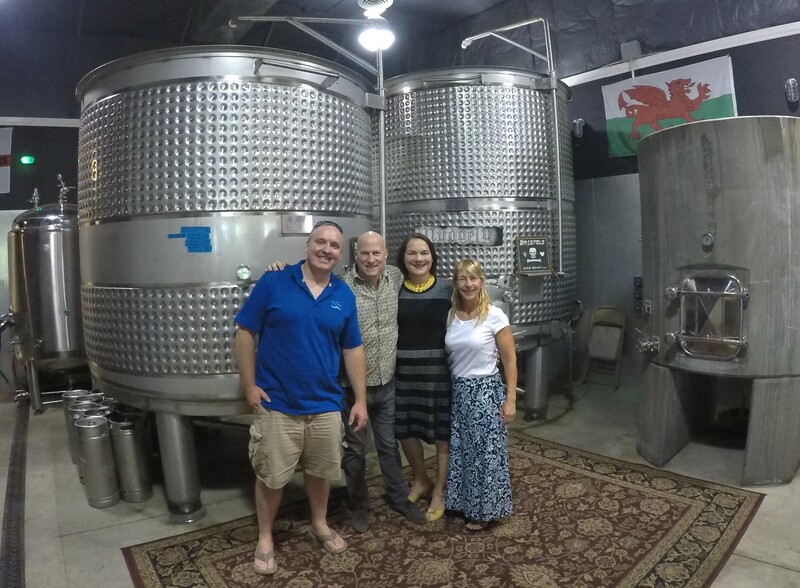 The Bristols Cider House owners Neil and Marci Collins and Jackie Meisinger (Neil and Jackie are siblings) founded Bristols in 1994 to bring English cidermaking to the Central Coast. 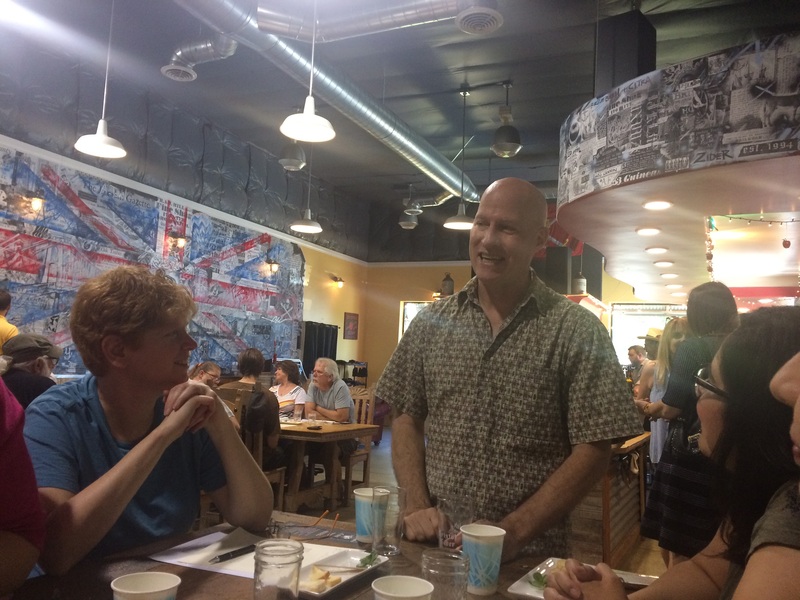 As participants took their seats, Neil, Jackie, and Erich welcomed all of us and introduced Fromagerie Sophie co-owner Paul Doering. Sophie Boban-Doering arrived a bit later to walk us through the last cheeses in the pairing. Fromagerie Sophie cheese selections for the pairing (from left): Kirkham’s Lancashire Mature, Montgomery Cheddar, Langres, Celilio, Soumaintrain. 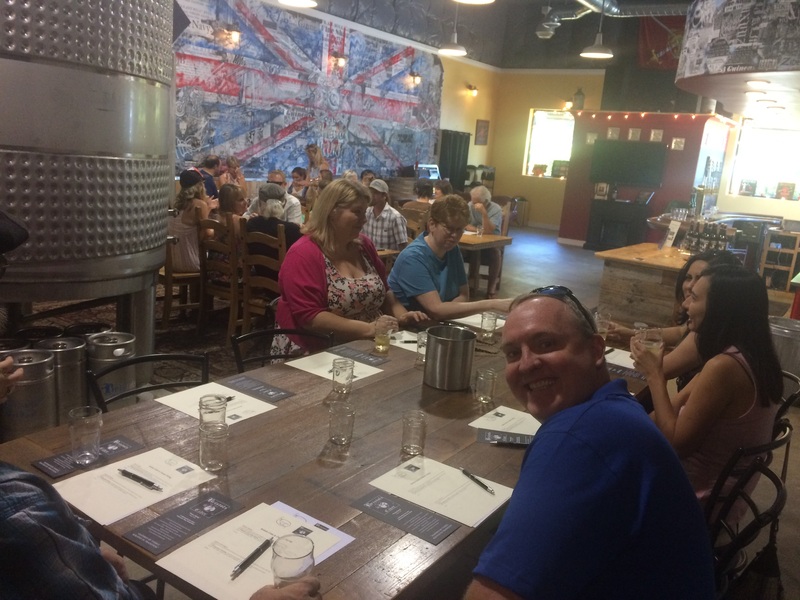 Paul placed gleaming porcelain plates in front of each participant, with five cheeses artfully arranged from left to right, while Erich and Jackie poured the first cider of the pairing. The excitement in the room was thick. We all couldn’t wait to begin. Here are the five pairings and a few of our thoughts. Cider: Bristols Original (The OG). A fresh and classically styled English dry cider. Cheese: Kirkham’s Lancashire Mature. Unpasteurized cow, traditional rennet. Neal’s Yard Dairy, Lower Beesley Fram, near Goosnargh, Lancashire, England. 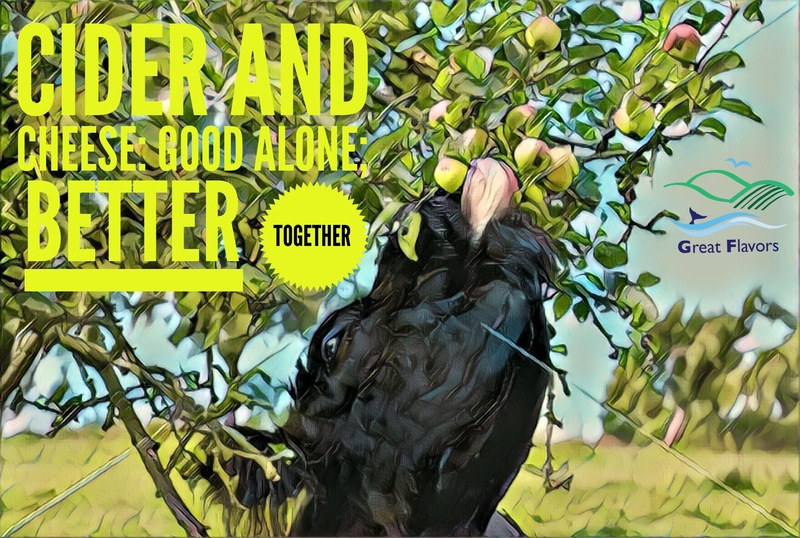 Flavor Team notes: We both really like the OG cider. You can’t go wrong with this quality, traditional cider. The hard cheese, like cheddar, we learn is made from raw milk from happy cows. Strong taste but very good. The pairing tones down the sharpness of the cheese. Flavor Team member Andrew and others at our table are excited to taste great cider and great cheeses. Cider: Bristols Skimmington. A still farmhouse scrumpy with brettanomycus funk (from two strains) going on. Cheese: Montgomery Cheddar. Unpasteurized British Friesian cow’s milk, traditional rennet. Neal’s Yard Dairy, Manor Farm, North Cadbury, Somerset, England. Flavor Team notes: Skimmington is murky and still, rather than carbonated. The brett brings out a sweet, yeasty flavor and rich aromatics. The cheese is a traditional hard cheddar, with a snappy but subtle horseradish finish (yummy). We can see why Paul says it’s“England’s best cheddar.” Darn good cheese, both alone and in the pairing. Fromagerie Sophie co-owner Paul Doering shares more about the cheese-making process. Cider: Bristols Granata. Named after the Latin word for pomegranate, this pretty pink and tart cider blends Newtown Pippin cider with 30% pomegranate cider. Cheese: Langres. Pasteurized cow, traditional rennet. Aged five weeks. Tribalat Germain, Langres de Champenois region of France. Flavor Team Notes: Lactic fermentation keeps the PH lower and results in “Shar Pei-like folds,” explains Paul. Very delicate, almost cakelike, yet with a strong flavor. The rind is washed in champagne and annato as it ages, and the finished cheese has two distinctly different textures: goo-like near the rind and firmer toward the center. The Granata is a lovely garnet-hued cider that has a bit of a bite. It toned down the Langres and made for a very nice combination. Cider: Bristols Barti Ddu. 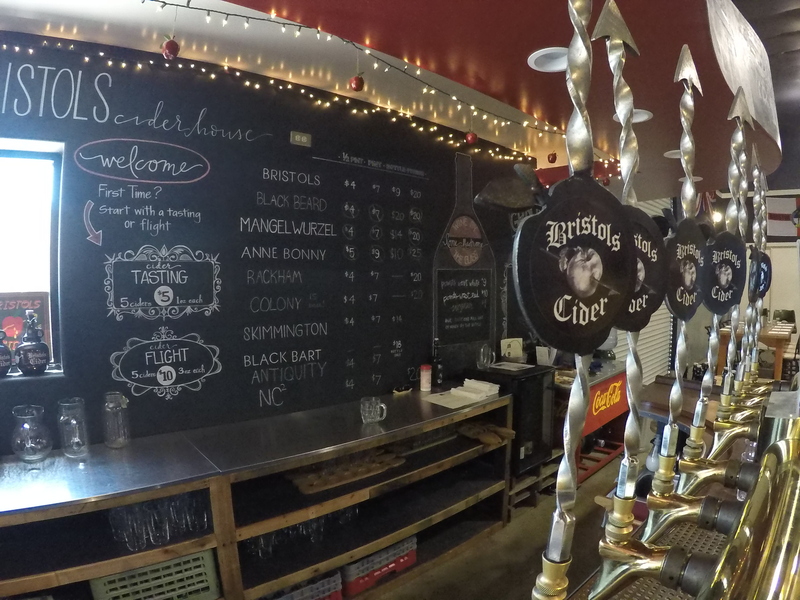 Please don’t ask us how to pronounce it (we just like drinking it) but we do learn the name is Welsh for “Black Bart,” and that Bristols names its ciders after British pirates and noteworthy national figures. It’s a 100% Granny Smith apple cider that is dry hopped using English hops. Cheese: Celilio. Organic unpasteurized cow’s milk, washed in Heritage Douglas Fir Gin, aged 75 days. Cascadia Creamery, Trout Lake, Washington. 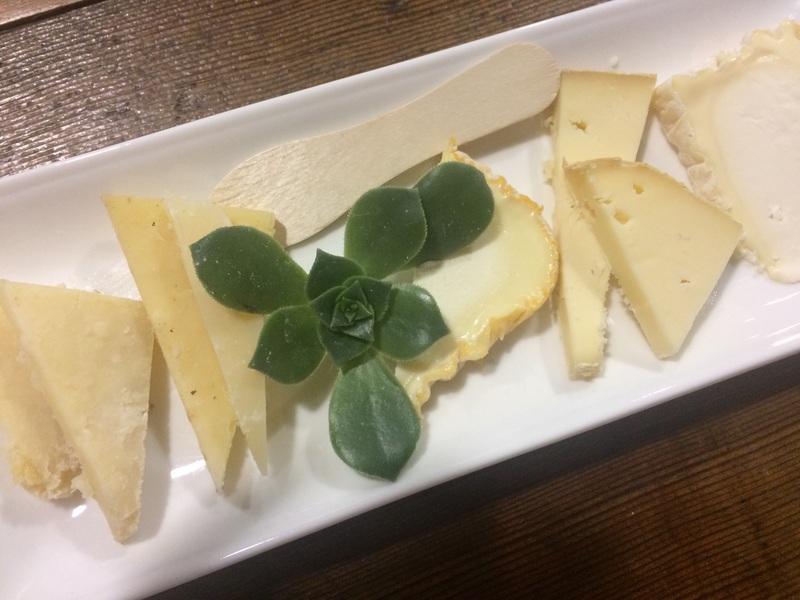 Flavor Team Notes: Sophie shares this cheese is from really happy cows (we wonder if the Doug Fir Gin has anything to do with that) from a farm with the highest animal-husbandry practices. It’s creamy, almost like a Brie, and has floral hints (also tastes of fresh-cuts boards from the gin wash) that pair really well with the hopped cider. For the cider, generally neither of us likes hoppy cider, but this is one that may change our minds. Sophie Boban-Doering, co-owner and namesake of Fromagerie Sophie, discusses how the cheeses reflect the country, culture, and environment in which they’re made. Cider: Bristols Black Beard. This cider, from a variety of applies like Arkansas Black, Black Twig, Honey Crisp, and Newtown Pippen, is aged 18 months in bourbon barrels. The result is the masculine side of bourbon (not the sweet vanilla side), and is slightly yeasty and definitely complex. Good stuff. Cheese: Soumaintrain. Pasteurized cow, traditional rennet. Washed rind, aged about two month. Berthaut Soumaintrain (province of Yonne), Burgundy, France. Flavor Team Notes: “Classic stinky French cheese” is how Paul describes this triple-cream cheese that’s an award winner from the Paris Cheese Competition. He shares how the cheese-making process results in the proteins slumping into its soft texture. The cider cuts some of the intensity of the cheese, and the bourbon aging seems to bring an assertiveness that goes well with the bold flavor of the cheese. Andrew: The Bristols Granata (aka pomegranate cider) was outside of the norm and delicious. For the cheese, The Montgomery Cheddar really hit a note and can see why it is “England’s best cheddar.” It went well with the pairing, but good by itself. I am starting to like the infused ciders, but always a go for nice dry cider. Kara: For cider, I give my Flavorites thumbs up to a tie between the Bristols Black Beard and Bristols Skimmington. To me, they’re rather on far ends of the cider spectrum, which I find interesting. Cheese-wise, I give another thumbs-up tie (don’t judge me). For sheer eating enjoyment, I also pick the Montgomery Cheddar. When I want a cheese to pair with some cider, I’ll go with the Soumaintrain. My Flavorite overall pairing is Pairing 2. Fromagerie Sophie owners Sophie Boban-Doering and Paul Doering with the Flavor Team after the super-successful and fun cider/cheese pairing event. As we were putting together this story, we talked about how our palates are developing and changing. We’ve definitely seen it with wine, and now we are seeing it in our cider tastings. For example, just a few months ago, I remember tasting some of the more lively or “less traditional” ciders (i.e., those outside the dry, crisp, appley, sparkling range). While I could appreciate the art in making them, I didn’t honestly love them. Now, Skimmington is one of my Flavorites and Granata is one of Andrew’s Flavorites. It will be fun to see how our cheese palates develop over time. And, hmm, an interesting a correlation to living a great flavored life. Palates – appreciation and enjoyment – change in more than food and drink, and that’s a very good thing in life, in my opinion. The more we learn and experience new things, the more new things come along to experience. Cool how that works. 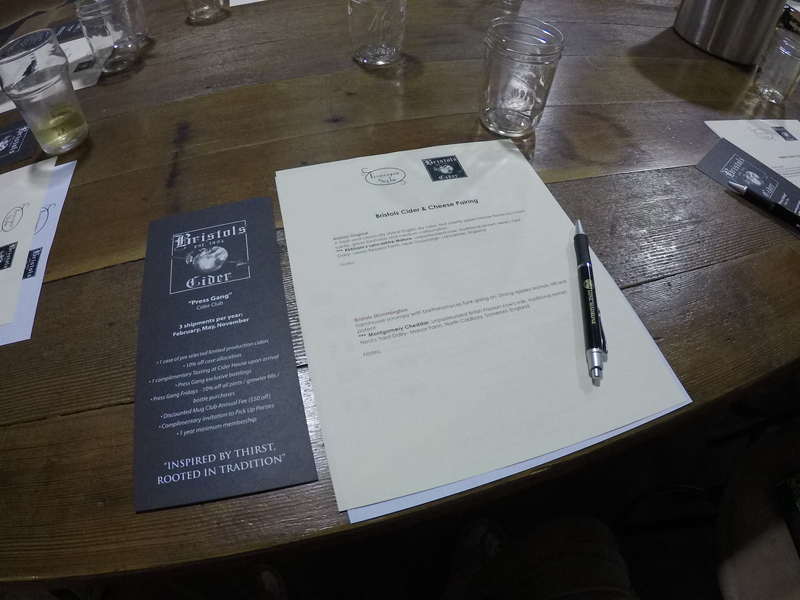 Judging by the lively conversations going on at every table and the great interactions with Bristols and Fromagerie Sophie folks, the pairing was a complete success. Great people, living their passions, sharing their gifts with world, and spreading joy one cider and one wheel of cheese at a time. It really does make the world a better place. We hope there are more of these events in the future. We’ll keep our eyes open for the next cider and cheese pairing, and will post it in our Calendar. Hope to see you there! ‘Til then, keep tasting the great flavors of life! Have you had the opportunity to enjoy a cider/cheese pairing? What were your thoughts? Do you have favorite ciders or cheeses? Please let us know and we’ll cover those in future stories.